If you like vegetarian enchiladas, we pretty much have you covered. We’ve got enchilada stacks and huevos rancheros enchiladas and even cheeseless enchiladas made with cashew cream. But this is the enchilada recipe that started it all! It’s also one of the first recipes I posted when I started blogging nearly 4 years ago. 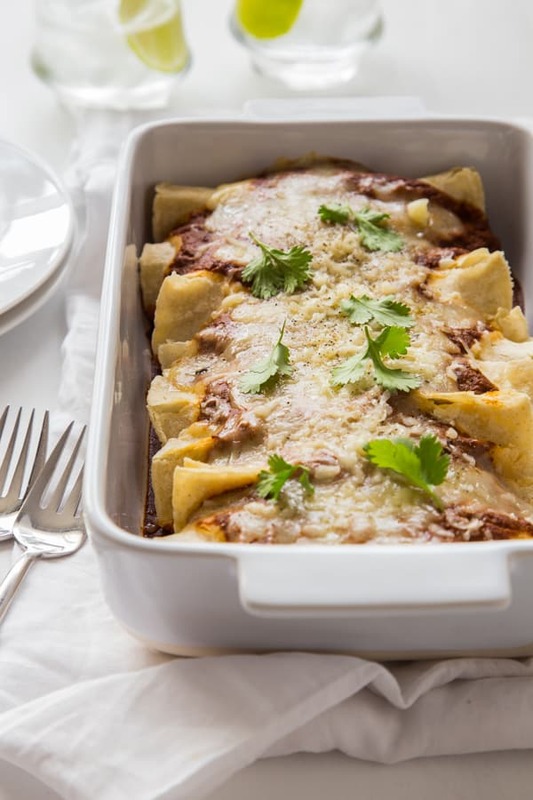 Enchiladas, like pizza, pasta and sandwiches, are one of those blank slate kind of meals where you can get creative and wing it and you can be pretty confident that they’ll turn out delicious. And like so many of my recipes, this one was inspired by a meal I ordered at a restaurant — sweet potato and tofu quesadillas with gorgonzola cheese and candied pecans. The candied pecans and gorgonzola were out, but the sweet potato and tofu filling was in, along with a homemade mole sauce. The smoky sweetness of mole is perfect with sweet potatoes. These take a little bit of prep work, but much of it can be done in advance. I always like baking my sweet potatoes because I think they taste better after a good hour in the oven, but microwaving will cut a significant amount of time from the recipe. 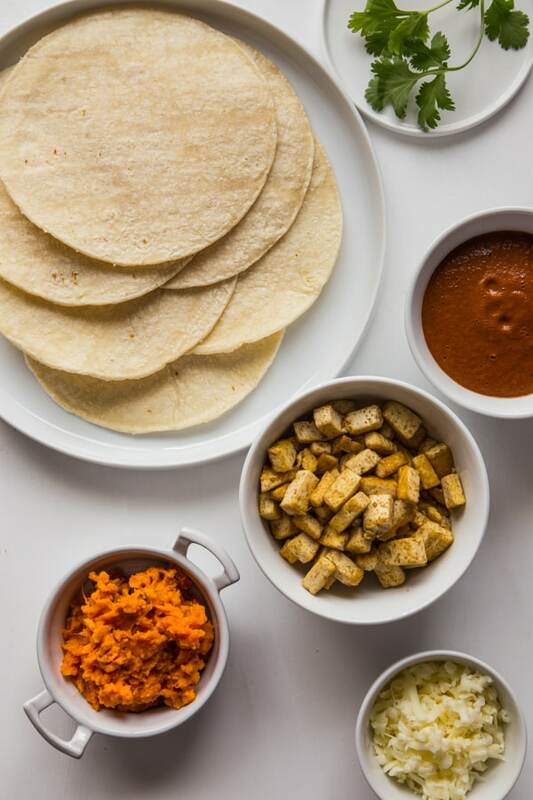 Just about every component of this recipe can be prepared a few nights before — the baked sweet potato, the tofu and the mole. Once you’ve got all the components ready to go, it’s just a matter of assembly and 20 minutes in the oven, then it’s enchilada time! This January, we’re republishing updated recipes from Oh My Veggies’ first year. This post was originally published on March 14, 2011. Most vegetarian enchiladas use either beans or cheese in the filling, but this recipe uses tofu and sweet potatoes instead. Adapted from Vegetarian Times’ Cheese Enchiladas with Easy Mole Sauce. Heat the coconut oil in large stockpot over medium heat. Add the onions and cook about 12 minutes, or until lightly browned. Add the garlic, chili powder, brown sugar, cinnamon, chipotle chili powder, and ground cloves and cook about 1 minute more, or until fragrant, stirring constantly. Heat the coconut oil in a medium skillet over medium-high heat. Add the garlic and cumin and cook 30 seconds, stirring constantly. Add the diced tofu and cook about 10 minutes or until golden and crispy, stirring occasionally. Season with salt. Scoop the insides of the sweet potatoes into a medium bowl and use a fork to mash them. Fold in the cilantro and tofu. Ladle enough mole sauce into the bottom of a greased 9 x 13 glass baking dish to cover it entirely. Divide sweet potato mixture into tortillas and place opening-side down into baking dish. Top with the remaining mole sauce and cheese. Bake for 20 minutes, or until cheese is melted and the enchiladas are heated through. Garnish with additional cilantro leaves, if desired. These sound delicious – love the sound of the sauce – a great dish for Meatless Monday! This sounds so good! I've never made a mole sauce, but it sounds pretty easy – I'm adding this to my things to make file! I made these tonight as one of my “pantry clean-out” recipes, when I had both sweet potatoes and tofu to use up. Really delicious, and my picky husband went back for seconds, which says a lot. I’m so glad you enjoyed the recipe–thanks for letting me know! This is insanely good! My wife and i will continue to make this go-to recipe. Best vegetarian enchilada recipe by far! These enchiladas were really good. A great addition to my meatless Monday menu. My family is not crazy about tofu, so I substituted black beans and it was great. Black beans would be perfect in these! I’m glad they were a hit! This recipes sounds great and I want to try it. I have one question though. It says 1/4 cup chili powder for the sauce. Should that be a teaspoon or a tablespoon? These enchiladas are DELICIOUS!! First off, I LOVE mole sauce, and I have spent years searching for a really good recipe for it. The search has finally ended, and this right here is IT – so many subtle yet complex flavors and the perfect amount of heat! I truly love it, and so did my family. Secondly, this is a great hearty meal that even meat lovers will enjoy. Fry the tofu up just right and even a die-hard carnivore like my father will clean his plate. I’m so glad you enjoyed the recipe – thank you for your comment! This mole sauce is great! I used half regular chili powder and half ancho chili powder. Will definitely make these again! My only other change was to microwave the sweet potatoes to save time/not heat up the house. Really nice recipe. Would be good with black beans instead of tofu too. Yes, microwaving the sweet potatoes works too! 🙂 I’m glad the recipe was a hit! My boyfriend was craving mole and I am a vegetarian, so I made this tonight as written except that I used black beans instead of tofu, which makes it a bit less labor-intensive, and I added a bit more more chipotle pepper. It was delicious! Next time I would use two cans of beans because I had some sauce left over and could have made a few more enchiladas. Thanks for a great recipe. This looks extremely delicious and wonderful, I can’t wait to make! I’ve just started to cook with tofu so wanted some more recipes! HI, I see so mant delicious recipes with tortillas but no recipe for them. I can’t find any healthy ones here where I live. These are officially what I wish I were eating for dinner tonight! awesome recipe, thanks!!!!!!! fabulous vegan mexican concept, congratulations. only recommendation is to be a bit more conservative with the chili powder. 1/4 cup i think is too much. i did one tbsp and it was about right, considering that i LOVE quite spicy food even by most indian standards. thanks! Thank you, thank you, thank you I am the only vegetarian in my family and really wanted to introduce tofu in positive way to the kids 3yrs and 4yrs old. This recipe went down so nicely and was absolutely delicious. The mole sauce is so tasty so for sure this recipe is going to make many an appearance at meals time this year. I did make a couple of adjustments as I love fresh lemon juice squeezed on my sweet potato fries or baked sweet potatoes I added the juice of half a small lemon and a little salt to the mash. Also I threw in a little tangy curry powder that I have into the fried garlic and cumin mix before sauteing the tofu. This is a favorite of mine! The mole sauce is so good! Thanks Alli! We love the mole sauce too!